This Image Manifested as a fusion between a hand painted image and the digital world. 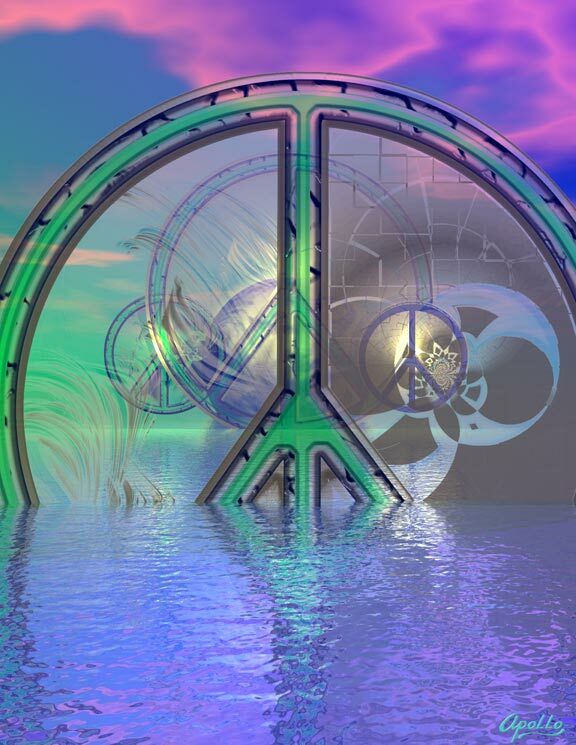 After creating a Painting entitled "Abstractions of Peace and Love" and while thinking about creating a special Image for The "Bridging Heaven and Earth" Art Project a chain of events transpired from which this Image Evolved. The hand painted image was a through back to the Peace Movement of the 1960s and is dedicated to a generation who with the exceptions of a few wanted to make the World a better place for all. I sent the Image out to a few friends and collectors and one my collectors decided to purchase the piece. I took a digital Image of the painting and transported it into a few different Creative programs and this was the resulting image.To me it represents the fusion of not only a hand painted piece and the Digital World, it also represents and reflects a truth that we as a species have the advantage of incredible NEW Technology at our disposal and the World is full of Creative People With Solutions for every situation that Man and Our Planet has a need to deal with. We have the Technology. We need to allow those with the solutions to come forward so that they can be openly reviewed for the betterment and advancement of Humanity. We are Creative Problem Solvers. As a species that is what we do, that is what we have always done. The Multi Dimensional Universe is allowing us to segway into a new paradigm of Our Spiritual Evolution. It Truly is A Time For Peace! Watch on UTube Click Here!